You know how everybody keeps preaching that you should eat beans but don’t really tell you how to really cook them..Well I am here to fill that lacuna with Chicken and Beans in Green Olive Tapenade. This recipe has chicken but you can easily replace it with paneer or Soy.On a sidenote-the soy in the market is amazing now.Not like the hard pieces of cardboards that were sold around 10-15 years back but actually soft silky soy so definitely give it a try! 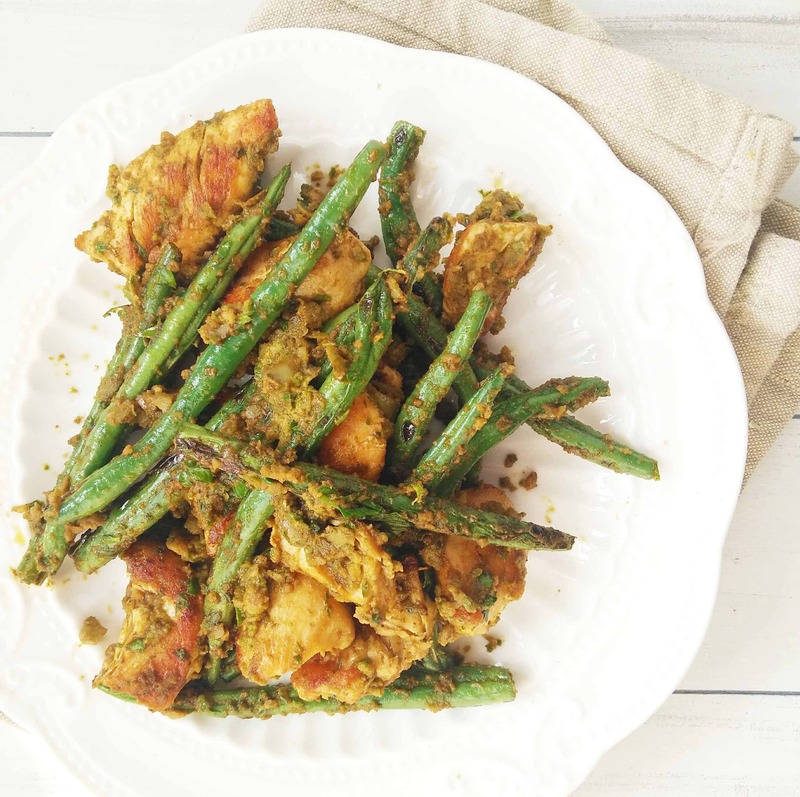 Coming back to this Chicken and Beans in Green Olive Tapenade dish..Its a milieu of too many thoughts…I wanted to eat something healthy yet filling..hence the protein-Chicken.I wanted to use up the beans in my fridge and I wanted to make a tapenade. Tapenade is usually made with olives and capers but I didn’t have capers so I didn’t use them.I used Green Olives,basil and olive oil to make it.And cause I am Indian and we love our zing, I added a bit of chilli to it too. The beans…Oh the beans..I won’t lie to you but this is the first time I have loved beans! Till date I have been merely tolerating them but this dish has made me a staunch paramour of beans.Its not cause of the beans in themselves but the way I cooked them.You need a strong hand with them. The pan has to be blazing hot and smoking when you put the olive oil in and blister the beans.This method takes about 3 minutes to blaze and blister the beans to perfection. Heat the pan.Once it starts smoking add the oil. Add the Chicken breast and cook for 4 minutes.Keep changing the sides. Meanwhile Add basil,1 tbsp of olive oil, olives,salt and chilli in a blender and make a coarse paste. Remove the chicken from the pan.Add the left over 1 tsp oil once the pan is smoking. Add the beans and toss them around till blistered to perfection. Add the cooked chicken and the tapenade. Saute to coat everything with the tapenade. This can be served on a bed of herb rice,along side pasta or with bread.